It sounds almost like a oxymoron, doesn't it. A glamorous kitchen? For those who are serious about their cooking, or have little ones running around, a kitchen isn’t a place for glamour. It’s for making a mess, feeding the masses and wreaking havoc in. Despite how strange it may seem, making your kitchen a glamorous space will actually make you want to spend MORE time in the kitchen - gathering with family, friends, cooking, creating even doing homework. Wallpaper can have the same effect- a bold, feminine design that will instantly draw the eye and excite the senses. If you don't like wallpapering all walls, consider using panels, or an accent wall. Glamour is a quality that makes a person or a thing appealing or special. Imagine feeling drawn to and happy in your kitchen space. Sound nice? We think so too. A chandelier will inject instant glamour into any room, whether it’s a fuchsia pink plastic one or a glittering cut glass one. 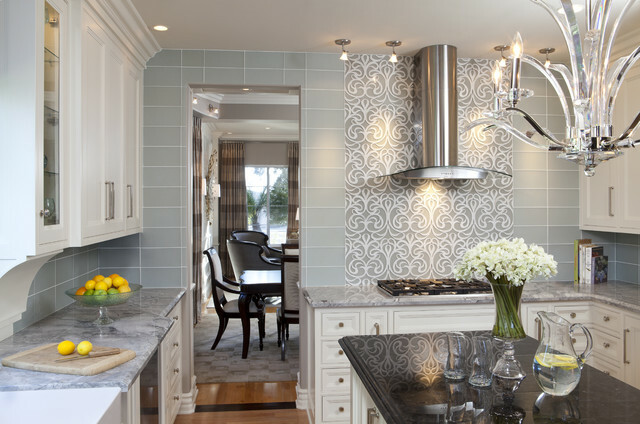 A charming light fixture helps to create a more ambient area as opposed to the harsh brightness of the central light. Consider adding some over the breakfast area, island or peninsulas. Add drama to the room with a splash of color. A passionate red or a regal purple, or if you’re feeling brave, something darker will make the room feel warm and sumptuous, as opposed to clean and clinical. Alternatively, go for a classic white, glossy kitchen with pastel accessories for a 50’s Hollywood glamour feel. Whether it’s through the reflective, glossy surface of your cabinets, or glittering glass mosaic tiles or simply through some sparkly accessories, sparkle is essential for a glamorous kitchen.